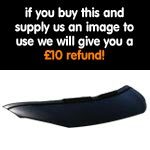 Car Bra's are the ideal way to protect the bonnet and bumper of your car from stone chips, bugs etc. They cover areas on your car that could be prone to damage whilst driving, and in turn could help retain the cars value. Our Car Bra's are manufactured to the highest quality from a water resistant PVC leather. They are also have a felt lining, so to protect the underside of the bonnet. The bonnet bras are very easy to fit and remove, they simply slide over the bonnet like a sleeve and then are usually fastened by 2/3 straps that fit on the underside so to hold it in place. Both versions also incorporate wind-deflectors. These are a safety requirement and are they make sure the bonnet bra does not flap around at high speeds. We offer 2 solutions, either just a bonnet version that just covers aprox 1/4 of the bonnet area, and a full mask which is a one piece solution that covers all the bumper and 1/4 of the bonnet area. These are Available in a range of colour options (for a small additional cost), your Car Bra will be made to order, to suit your specific vehicle. We can also offer a range of colors. Black is the standard, but we can offer the following at an extra cost. "All our Car Bras are custom fit for your specific Vauxhall model."